Supply lasts a 10 lb. (4.5 kg) cat for 5-1/2 months. Sources of arachidonic acid discussed below. 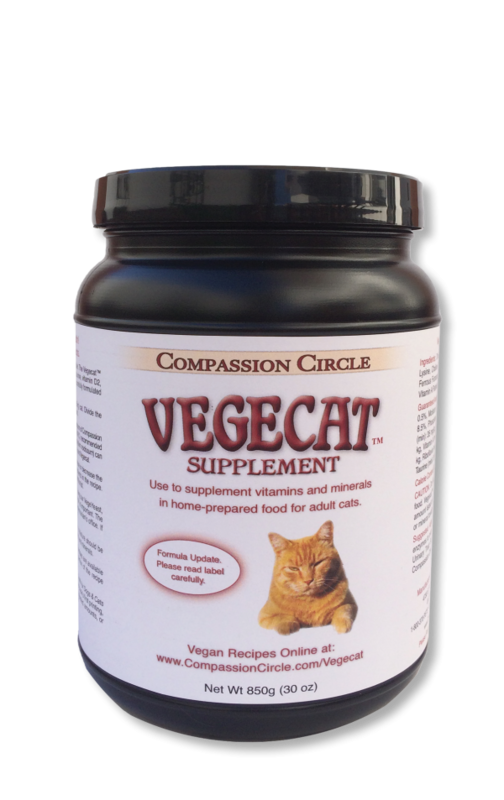 Vegecat™ no longer supplies the essential fatty acid arachidonate. Add 1 rounded teaspoon of Compassion Circle’s Green Mush™ (4g) to the diet per day to meet the National Research Council (NRC) recommended amount of arachidonic acid. Alternatively, add 1 compact teaspoon of Chlorella Manna™ (2.25g), or another chlorella vulgaris product. One rounded teaspoon of powdered (ascophyllum nodosum) kelp (4g) can be used in place of Green Mush or chlorella vulgaris. All recipes include food yeast. We highly recommend using our VegeYeast, a brewer’s yeast more acidic than most food yeast.